Charterhouse were very pleased to sell an Italian maiolica istoriato pottery charger for a staggering £460,000 plus premium and VAT, despite having a chip. We visited the client in a Somerset cottage who wanted to downsize and move near to her family. Amazingly, this pottery charger, which dates to 1540, was mounted in a coat hanger wire frame and hung on a wall behind the kitchen door. Having removed the charger from the wall, it was taken back to our salerooms where research started to properly identify the charger. After several months of research, the charger was entered into an auction dedicated to it, such was the importance of this one lot. 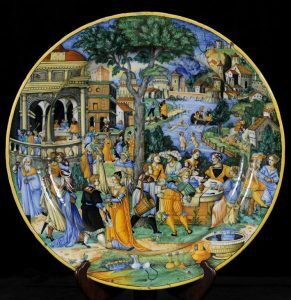 Viewing for this Italian charger, which tells the story of King Herod and Salome, was by appointment only, with many dealers, academics and collectors making the journey to our salerooms. On the auction day, there was not much standing room and even our Town Mayor made an appearance. The hammer finally fell at £460,000 to a Bond Street dealer bidding on the telephone.